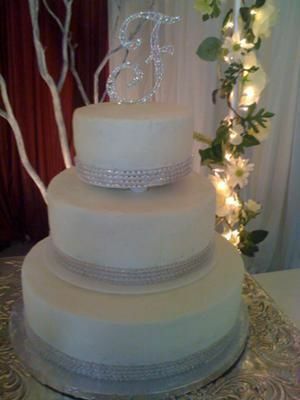 It is a stacked 3 tier white cake with strawberry filling, and butter cream icing with a pearl dusting. The rhinestone borders are individual rhinestone chains that I glued on to a ribbon, and I attached them with a flower pin. The topper was ordered online.